What happened next...: Muddy & Tough! 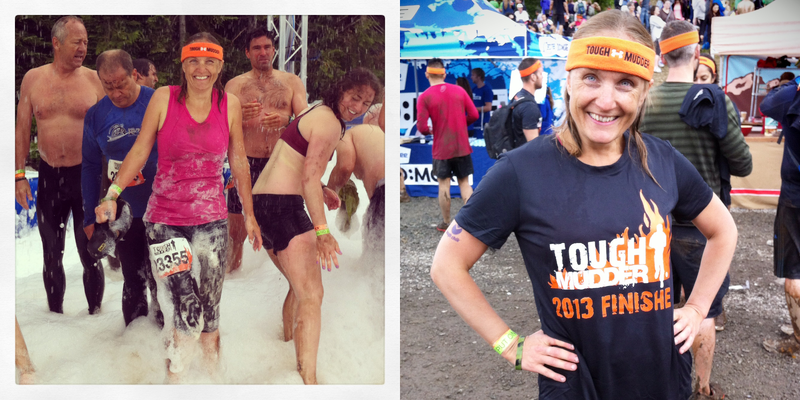 Last weekend hubby and I took part in our first* Tough Mudder in Whistler, BC. It was something I'd been looking forward to! The week leading up to the race though, not so much. I had some serious apprehension about some of the obstacles; the Arctic enema; the electric shock stuff, Everest and running through fire....I mean, seriously - what was I thinking??! Spoiler Alert: I lived to tell the tale!!! It had rained overnight, the ground was wet, and it was overcast but it never actually rained - with the temps in the late teens it was pretty perfect conditions! After getting on one of the 75 school buses drafted in to transport participants from Whistler Village to the Olympic Park 25 minutes south of town we arrived at the event site with time to check out the early starters coming through some of the onstacles, grab some welcome Clif bars and get our bag checked. Our team got going around 10am - and the first 'obstacle' was a 6 ft wall just to get into the start area for our pre-event pep talk and national anthem! We were right at the back of the pack - just scraping into the area for our time slot. Despite starting from the back of our wave I was pleasantly surprised at the minimal line-ups at each obstacle - no more than a minute or two, which was often a welcome break after running between areas and re-grouping the team (And to check out what exactly the next obstacle was!) That was another of my pre-event 'dreads' and again it was quashed as soon as we got going. There were 20 obstacles spread over a 18km route. There was more running sections than I expected - sometimes we'd be jogging along for 15 minutes at a time and then there'd be a quick succession of 2-3 obstacles in a short space. Rocking my Team Tough Chick tattoo! Had to wipe the mud off specially for that photo!! At the end I was happy to have done it. 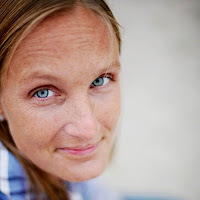 In many ways the obstacles weren't as bad as I was expecting....I have a good level of fitness and stamina with my half marathon training which I do think helped tremendously. 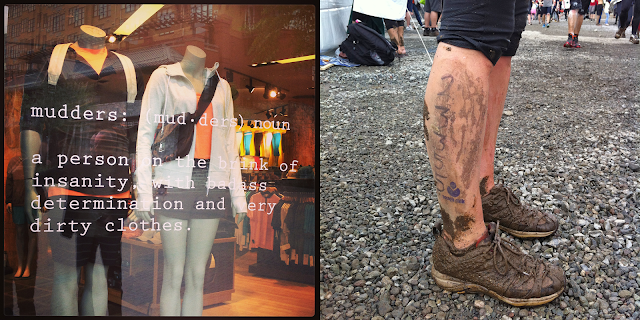 And once you embraced the mud and the filth of it all many of the obstacles were just about getting down and dirty. Afterwards people were chatting and asking 'which ones did you find hard?' I think for me it wasn't so much about being 'hard' as putting myself outside of my comfort zone. Jumping over fire isn't hard but perhaps just something I'd prefer not to do every day!! The Arctic Enema wasn't hard it was just f**king cold, uncomfortable and something I'd probably die from if I wanted to do every day. For me, a better way of putting it perhaps.....the 2 least pleasurable obstacles of the event - that arctic enema (am I going on about it d'ya think??!!) and the electroshock therapy - which was bloody painful and I'm thankful I was one of the 'lucky' ones that didn't get shocked so bad I got knocked to the ground! The Monkey Bars were 'hard' but after testing out my grip, and realising the absolute lack of it, I just hurled myself merrily into the cold pool below to give myself the best head start possible on my swim across!! I surprised myself at 'enjoying' the trench stuff - whilst I'm not really claustrophobic I wasn't overly looking forward to them - especially when some were flooded with water - great - small tunnels AND frigid water! But everything becomes relative - and the water in those trenches was 'warm' compared to others! Would I do it again?! In some ways I think I'm not overly bothered. Definitely not because I didn't enjoy it, but because I've done it. And seriously I have no desire whatsoever to jump in icy water again and get electrocuted. A second time I'd have to deal with the 'known' rather than the 'unknown' and I know I don't like them. BUT. The teamwork, friends and camaraderie is what'll bring me back next year. And we've already got people inspired into signing up next year. So yes, this was my *first Tough Mudder!! Wow, what an adventure!! I'm not sure I would go out of my way to find one, but if a bunch of friends all did it together, it would be a blast! I highly recommend it - at least once...and I'm finding in reality it probably won't be 'just the once' anyway!! I guess like lots of these things you get sucked in! Haha! Thanks Sheila. The electro-shock and arctic enema I'm already dreading!! WTG! I've done several mud/obstacle runs but never a Tough Mudder. I'd love to! The days leading up to it I was really wishing I'd tried some of the smaller scale versions - but nothing like jumping in the deep end - I think it does seem to be one of the 'tougher' versions out there! But with good fitness levels and a daredevil 'give anything a go' attitude its great! Wow! Way to go. I'm too intimidated by Tough Mudder! If you run marathons and don't mind getting dirty you'd be great. They have the attitude (which there are signs along the course repeatedly reminding you) it's a challenge not a race - and there are opt outs at all the obstacles so you do whats within your comfort level!